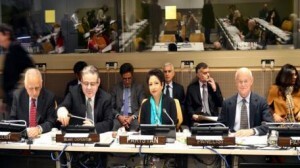 Pakistani Ambassador Maleeha Lodhi and other speakers at an event held at the United Nations voiced serious concern over the increasing hate crimes against Muslims in the West, saying that the most effective action to reverse this dangerous trend lay in promoting interfaith cooperation. They also stressed the need for unity among Muslims, as they build bridges to other religious communities through stepped-up interaction. The occasion was a side-event, organised by the Missions of Pakistan and Organisation of Islamic Cooperation (IOC), as part of the annual observances of World Interfaith Harmony Week (February 1 to 7). A brainchild of Ambassador Lodhi, the side-event was titled “Countering Xenophobia Through Interfaith Cooperation”. “This was a modest effort to bring us together in solidarity, in defence of our values and respect for each other’s faith, as part of human family to promote solidarity,” the Pakistani envoy, who co-chaired the event, told delegates in a full-to-the-capacity UN conference room.